ZXP Series 3 Ribbon, ZXP Series 3 IX Series YMCKOK Color Ribbon 165 Images/roll. The ribbon is used to print in a variety of colors: yellow (Y), magenta (M), cyan (C), and black (K). The remaining overlay (O) provides an extra layer of protection for the card. The second (K) allows for printing in black on the back side of the card. The ribbon is used to print on both sides of the card only. This ribbon is compatible with the ZXP Series 3 Printer. 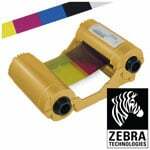 ZXP Series 3 Ribbon, Black IX Series Monochrome ribbon for ZXP Series 3, 2,000 image prints per roll. The ribbon is used to print in Black (K) only. This ribbon is used for printing text and one-color images on one or both sides of a card. Compatible with ZXP Series 3. ZXP Series 3 Ribbon, IX Series Black Monochrome Ribbon 1000 Images/roll. The ribbon is used to print in one color: black (k), This ribbon is compatible with the ZXP Series 3 Printer. 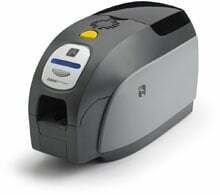 ZXP Series 3 Ribbon, ZXP Series 3 IX Series Eco High Capacity YMCKOK Color Ribbon 230 Images/roll. The ribbon is used to print in a variety of colors: yellow (Y), magenta (M), cyan (C), and black (K). The remaining overlay (O) provides an extra layer of protection for the card. The second (K) allows for printing in black on the back side of the card. The ribbon is used to print on both sides of the card. This ribbon is compatible with the ZXP Series 3 Printer. ZXP Series 3 Ribbon, Contain a black dye-sublimation (Kd) panel and a thin protective overlay (O) panel. 500 prints per roll. This ribbon is compatible with the ZXP Series 3 Printer. ZXP Series 3 Ribbon, IX Series White Monochrome Ribbon 850 Images/roll. The ribbon is used to print in a one color: white, This ribbon is compatible with the ZXP Series 3 Printer. ZXP Series 3 Ribbon, ZXP Series 3 KrO ribbon contain a black resin (Kr) panel and a thin protective overlay (O) panel. 500 prints per roll. This ribbon is compatible with the ZXP Series 3 Printer. ZXP Series 3 Ribbon, IX Series Blue Monochrome Ribbon 1000 Images/roll. The ribbon is used to print in a one color: blue. This ribbon is used to used to print text and one-color images on one or both sides of a card. This ribbon is compatible with the ZXP Series 3 Printer. Card Ribbons, ZXP Series, 1 Mil laminate contains Zebra's Holo Lock holographic design, which increases the security of your ID Card. A printer which allows for lamination capabilities must be used. 625 prints per laminate roll. Compatible with ZXP Series 7 and ZXP Series 8 printers with lamination modules. ZXP Series 3 Ribbon, IX Series Monochrome ribbon for ZXP Series 3, White, High Capacity 1,400 images per roll. Compatible with ZXP Series 3. ZXP Series 3 Ribbon, IX Series Monochrome ribbon for ZXP Series 3, Silver, High Capacity 1,600 images per roll. Compatible with ZXP Series 3. ZXP Series 3 Ribbon, IX Series Monochrome ribbon for ZXP Series 3, Blue, High capacity 1,700 images per roll. Compatible with ZXP Series 3. ZXP Series 3 Ribbon, YmcKO (short-panel or half-panel) IX Series Color Ribbon for ZXP Series 3, 400 Image prints per roll. The ribbon allows for printing in a variety of colors 1/2 the length of the card: yellow (Y), magenta (M), and cyan (C), and a full card print in black (K). The remaining overlay (O) provides an extra clear layer of protection for the card. This ribbon is used to print text and full-color images on one or both sides of a card. Compatible with the ZXP Series 3.